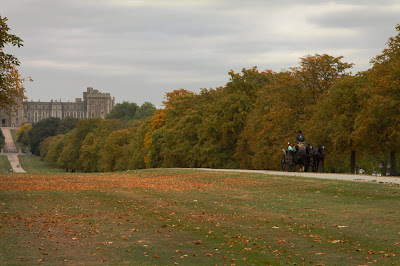 Most visitors to Windsor Castle enter from the gate in the town of Windsor and don't get to see this spectacular entrance, known as the long walk. Stretching 3 miles from the castle to the copper statue of King George III on a horse. Originally lined on each side by 1652 elm trees, these are gone now, having fallen victim to dutch elm disease. An inquiry and lots of meetings to discuss the problem (sound familiar?) and then, nearly 50 years after the elms had died an agreement was finally reached, and the horse chestnut trees were planted in a widened walk. Does everyone get to ride in a horse & carriage, with maybe the chance to play conkers on the way to the big house? In fact I lost it too. Thanks for letting us see it and discovering its existence. Impressive. I'll try to enter Windsor Castle from there next time I'll be there. Great Sunday to you all! This is the England I saw first time I went there: the magnificent colours of Autumn mixing with the green, fallen leaves on the lawn. Absolutely lovely...it's that kind of scenery that makes me absolutely dream of visiting England. I love the trees. The colours are amazing. You are so right. I've never seen the spectacular entrance. Someday I hope to! what a beautiful long walk. Sad to hear about the previous trees. glad they finally replanted as these trees look like they belong. Excellent photo. I like the leaves on the grass, looks like a colourful carpet. Gorgeous shot, and great story to boot. Are you on a first name basis with the Windsors? Wow - you timed the autumn leaves just right. Around here you tend to find them green one day and then bare the next (without much colour change) with all the leaves on the ground from a sudden gust of wind. I truly miss the foliage from my native NY state. I did the Long Walk one, at least partly, mybe in 1960? Oh to see London in the Fall.